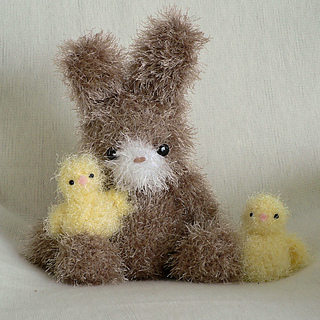 An original crochet amigurumi bunny pattern with FREE chick pattern, by June Gilbank. 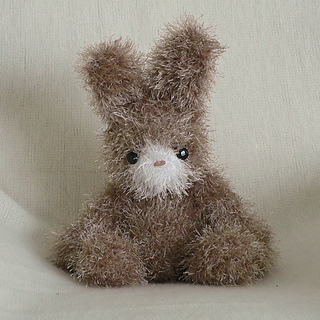 Size: Finished size will vary depending on yarn used; sample bunny is 11.5” tall as seated (including ears!) 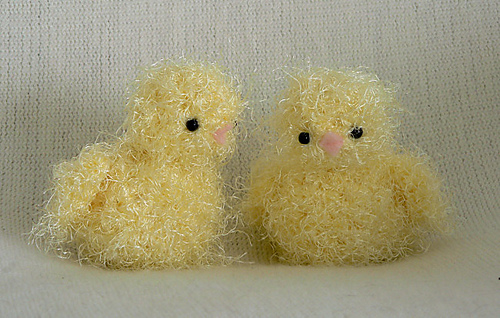 and sample chicks are 3.5” tall. 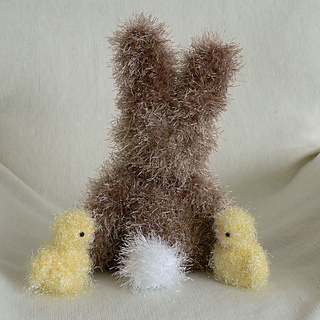 A note about ‘Fuzzy’ patterns: When I created my ‘Fuzzy’ patterns, in 2007 and 2008, there were a lot of different eyelash and other fuzzy novelty-type yarns available in most yarn and craft stores. Sadly, most of them have now been discontinued and it can be difficult to find a suitable yarn. You could substitute a different fuzzy yarn, or try looking on eBay.com or ravelry.com for someone who may have eyelash yarn for sale. If you can’t find any suitable fuzzy yarns, don’t despair: all my ‘Fuzzy’ patterns include an additional PDF file showing how to work these patterns with a regular worsted weight yarn of your choice, and then either leave them smooth, or brush them to get a different, but still cute, fluffy effect! 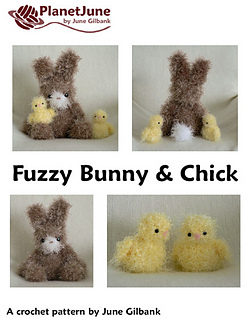 Save money: Take advantage of the savings when you buy any three Fuzzy Friends patterns of your choice as a custom set!